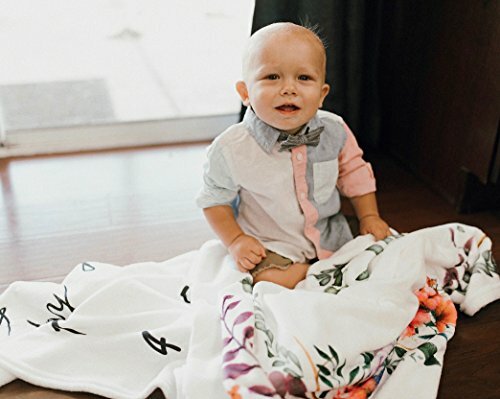 Our blanket is designed to provide maximum comfort and style to ensure irreplaceable memories throughout your little one’s first year. Featuring a unique and custom design which was hand painted using water color by our amazing company illustrator. Take Pictures Like a Professional! 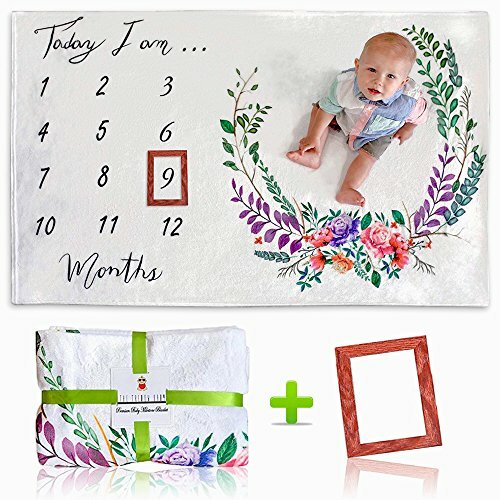 Use our trendy photo backdrop blanket to document all of the irreplaceable memories of your baby’s first year! 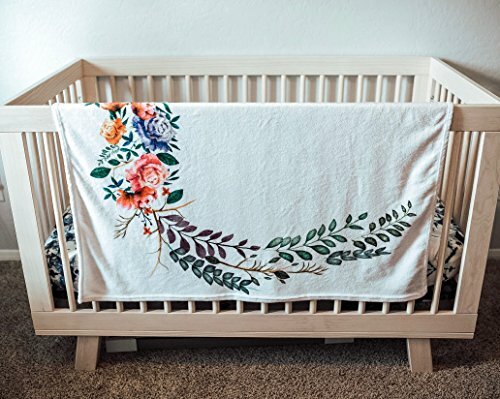 With our unique design and trendy oak finish frame, all of your friends will be commenting on your social media asking where you got your little one’s pictures taken! Record growth in your own creative way, we have left plenty of space so all of you artistic minded parents out there can add your own props to make the photos even more exciting.Use with a smartphone or a camera! Social Media Posts – Instagram, Facebook, Snapchat, Twitter, Pinterest, etc. Party Invites, Traditional Framing for around the House & MORE! Add Own Creative Props for Personal Touch! Letter Board, Milestone Stickers, etc. WASHING INSTRUCTIONS: Machine wash cold. Air or tumble dry low. Do not Iron, Dry Clean, or Bleach. 【FINALLY! 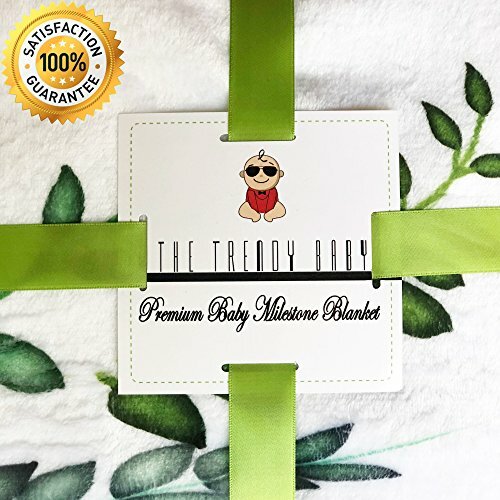 AN ALL INCLUSIVE PREMIUM QUALITY BABY MILESTONE BLANKET】 – We guarantee that our 250gsm thick soft fleece fabric is the best available on the market or your money back. 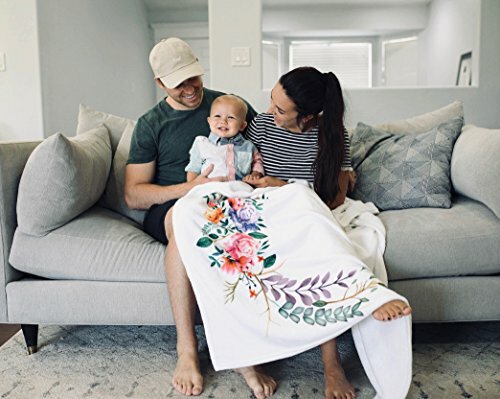 Not only is the fabric’s quality premium, our milestone blanket’s design was also hand painted using water color by our company’s illustrator, before being scanned and printed on to the blanket. 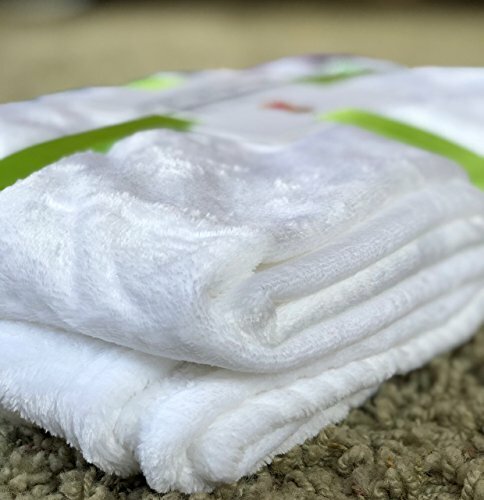 【WILL NOT WRINKLE OR FADE】 – Unlike other milestone blankets that will come out of the box wrinkled and will fade after a few washes due to their extremely cheap quality, our Premium Milestone Blanket is fade and wrinkle resistant requiring absolutely no ironing. 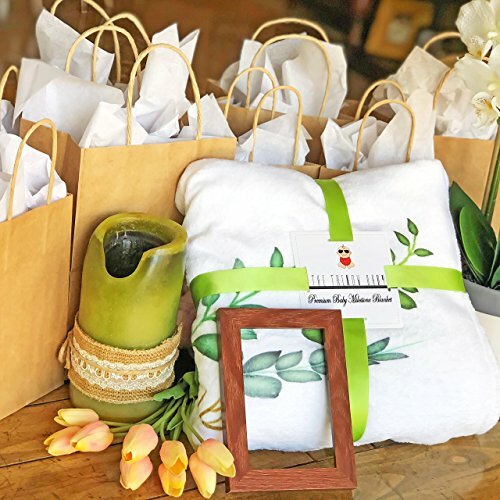 擄【THE PERFECT BABY SHOWER GIFT】 – Our Premium Soft Plush Fleece “60 x 40” Newborn Monthly Blanket is packaged in a beautiful green ribbon & bow to assure that the soon-to-be mother is blown away! Our gender neutral green ribbon is perfect for Mothers who have not yet revealed whether they are having a boy or girl. ✔️【100% SATISFACTION & MONEY BACK GUARANTEE】 – We take pride in our quality, but even more so our customer service. If you aren’t absolutely in love with our product we’ll buy it back from you within 60 days of purchase, no questions asked! 【LET YOUR CREATIVE SIDE LOOSE! 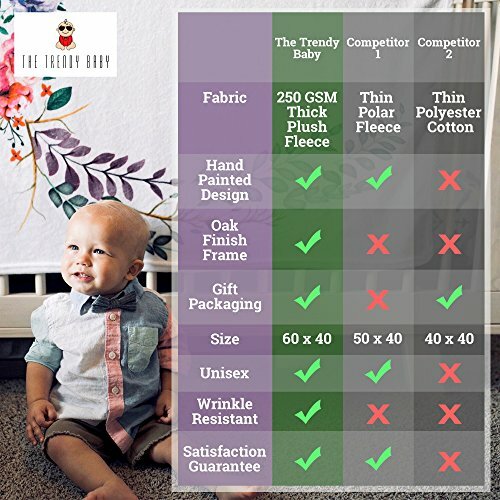 – BONUS WOOD STYLE FRAME INCLUDED】 – Here at The Trendy Baby we care about our customers & realize that nobody wants to buy an additional item that is a must have, to use the product properly. So, we included a complimentary frame with a beautiful oak finish to add a trendy look & give our clients the all-in-one package. Also feel free to enhance your backdrop further by adding & arranging your own custom props such as flowers, balloons, ornaments, ribbons, etc.